Wow! I am so excited about showing this GORGEOUS wedding that I can barely sit still in my seat! I am almost at a loss for words in describing how incredibly stunning every single detail and moment was for the whole wedding! Anne Bev, the bride, has been a dear friend of mine for a few years now. 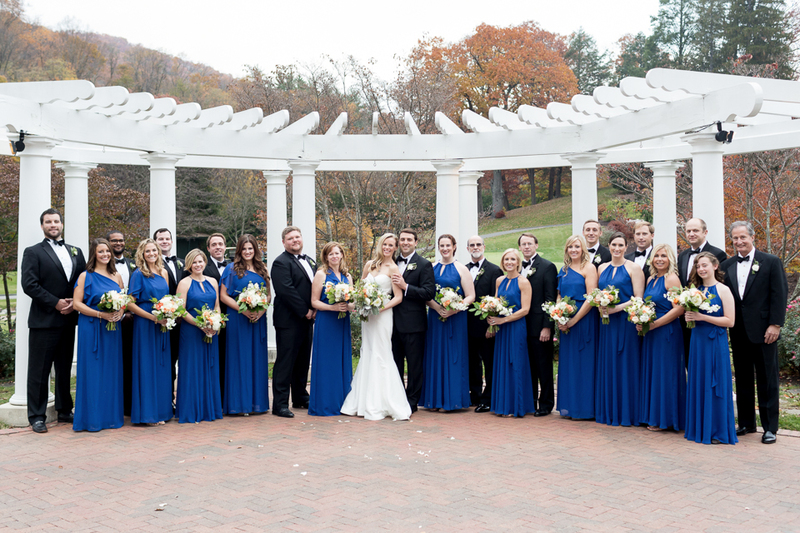 I was so blessed when she asked me to photograph her wedding and I almost fainted when she said her wedding would be at The Homestead in Hot Springs, Virginia. I obviously tried to contain my excitement to keep some professionalism but I truly was beyond ecstatic to have the opportunity to shoot in such a magnificent resort. I dreamt about it for months! Finally, the time had arrived to travel to Hot Springs, Virginia and even the drive there was simply magical... the Fall leaves were in their peak and the vibrant oranges were amazing! My husband came with me and we listened to Frank Sinatra all the way down which sort of put me in the classic romantic mood already, ha ha! When we arrived to The Homestead, I was simply wowed by there magnificent lobby area and I knew I wanted to take at least one FAB photo of Anne Bev and Burton (the groom) in the center of that lobby at some point! The rest of the evening was just spectacular and fun. They had an incredible and talented band play throughout the night. The large dance floor gave plenty of space for the 250 guest to get down! I loved that Anne Bev and Burton did a private cake cutting so that the dance party didn't lose momentum. Plus, it was sweet for them to enjoy each other's company privately for a few moments. I love those photos... And of course, I was able to sneak in that last lobby photograph that I so desperately wanted! It truly was romantic and makes my heart skip a a beat every time I look at the photo. This was one of my last weddings of the peak season and I feel like it ended on the highest note possible. I truly do love what I do!!! I love to tell beautiful visual stories... giving my clients memories to hold on to for generations... and simply photographing LOVE at its best. It sounds so cheesy and overused, but I do feel blessed! So very, very blessed! Thank you so much, Anne Bev and Burton! Be a part of your day was a true honor. Love you both!